We sold our 3 bedroom home and moved into what is known as a 2 bedroom apartment home. We sold all our appliances with the house because we just didn't want to move them. I spent over $200.00 at the complex laundromat over 11 months. I was getting tired of the washers and dryers breaking down. And I only did my wash once a week. All the apartments have a space for a washer and dryer. We had to buy an electric dryer because they don't provide the gas connection. And we can't make any modifications to the apartment according to our lease agreement. 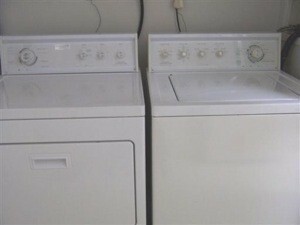 We purchased a used 3 year old matching Kenmore washer and dryer for $375.00 + $40.00 delivery charge. The used appliance store gave us a 90 day warranty. You sure can't beat the price of $415.00. Now is that being frugal or what? Good job! Kenmore appliances will last forever(almost). Not to rain on your parade ( I do admire your thrifty spirit! ), but you might have been able to get used appliances for free if you had checked to see if there is a freecycle group in your area. I see used washer/dryer sets and other major appliances listed for giveaway (i.e., for free) all of the time by people who are upgrading. I strongly encourage you to see if there is a freecycle group in your area, and if there isn't one, to start one. Your set is exactly like mine that I've had for 6 years now-problem free. !! Clever use of $$. You should also check regular appliance stores also because some stores will mark down an appliance if it gets a dent or scratch on it. I got my first stove like that and got it at a good price. Depending on the size of the dent as to how much they will knock off. The place where my stove went no one could see the dent. I think that you did quite well. I also want to tell about my freecycle goodies and I absolutely love that group! My Kenmore dryer was a freecycle treasure and it is in perfect shape. I have a great stand mixer, two lovely upolstered chairs and many great additions to our home and we did not spend a penny, except gas to get to the homes. The Habitat Re-Store is another great resource. Our stove was $65.00 and works great. Keep up with your thrifty ways. It is a fun life! We did well at our local Habitat ReStore, too. I'm not sure whether our Roper brand washer-dryer set was new or like-new. I do know they're the best we've ever had! And they only cost us $60 each, $120 plus tax for the set. Hubby paid friends of his a small amount to carry them in for us. We recommend the Habitat ReStore everywhere we go! Also, St Vincent de Paul's thrift store sold us a used twin-size Craftmatic bed for $75 plus tax and delivery. The only trouble I had with it was, the head lifted crookedly. And as with all thrift stores (and FreeCycle,) you have to move quickly to get the good stuff! The Kenmore washer and dryer for apartments are the best buys I have ever made. They last 20-25 years. I am on my second set (so guess you know how old I am..ha ha!). The motors are by Whirlpool. I watch my neighbors in this apt. complex trudge through ice and snow and rain with their laundry to our apt. complex laundromat, which is in one of the buildings out here. I know they spend a fortune on it. I keep telling them to get the Kenmore at Sears or wherever, but they keep on trudging through the crazy weather. What a great deal! My Kenmore dryer is still going strong and I think its 20 yo! lol. Like other posters here, I love utilizing freecycle and have given and received many wonderful things from generous people who care about our environment by not plopping stuff in the garbage to head to a landfill. I bought a Kenmore Calypso washer a little less than 5 years ago. It needed service about 2 years ago, and it quit recently again. The Sears service guy came and looked at it (for $70) and told me it would cost $500 to fix it. I decided not to get it fixed and went out and bought another washer. I just don't believe they make things to last anymore. When I bought that Kenmore Calypso, it was highly rated and quite expensive. Of course, If I had bought an extended warranty, the $570 service charge would have been covered, but this is getting ourageously expensive to keep an appliance working. I agree that second hand is the best deal if you can find it when you need it. This summer I bought a Maytag 3 yr old pair for $150 at a garage sale of household we knew, mom wanted the NEW style. Afterwards the lady said she liked her old dryer better. My son got this as the house they moved into had a 25 yr old sears set that you could count on NOT too much time left. 2nd son was in need of a dryer, so went to the 2nd hand shops, as we left, a pickup was backed up ready to unload a dryer. Recognizing the guy as the ONE WHO REPAIRS, RENEWS those taken from apts, etc we asked him, He said if we wanted what he was going to unload, we could come get it. The price difference? $75 more to move it into the shop--we paid $125. We had gotten a washer from him 2 years prior the same way. $125 for a refurbished washer, a couple years old. So last week when this washer started acting up again, my husband called him and the repair man said SURE I stand behind my work. So we got another washer refurbished, paid $50 and the guy took the other one back to work on. So for a 2 year use, it was a good rate. We had gotten an electric kitchen stove, Kenmore, back in 2001 for son # 3 from same guy. They still have the same stove, looked new when gotten. He had a sears 20cf fridge too, they still have that. $150 can still buy alot, when you know the right people. My own fridge? bought 1986, was 6 mo old. An older lady bought it from the sears store, but was heading for the apts due to health and wanted to sell as much of her household as possible. Put on local radio station trading post, I followed up, the sears people gave me the papers of delivery date. Paid $300 back then for the 20 cf. Still nice and running like new! My dryer just broke down and needed a repair. I called the repair shop and the guy told me "good luck if you plan to buy a new one!" According to him the older appliances last much longer and are easier to repair. Another plug for acquiring used appliances or at least not 'upgrading' to newer ones. Cheap is better than buying the latest and so-called greatest! I will only buy 2nd hand appliances because I had a really bad experience about 5 years ago with a brand new LG refrigerator with a freezer on the lower end. Let me tell you their warranties are good for nothing as well. I now go to a 2nd hand place and the owner checks everything on them and has anything you pick in excellent shape for using with a three month warranty and will repair anything he sells and if something it isn't worth fixing will be honest and tell you. I also found out that they also get new things appliances given to him and also other 2nd hand places that are new from places that don't sell in a certain time limit on the stores. Even though some are new they are checked over to see if they are working correctly and if needed repaired. They have to sell it as used, so if you are lucky you can get one of these. I will never buy a new appliance from anywhere again.